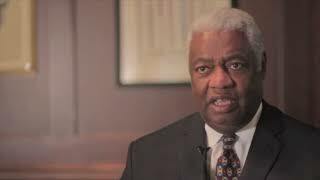 My name is Oscar Robertson, I'm from Cincinnati, the QUEEN CITY in the midwest. In April/May I had prostate surgery by Dr. Patel, and I want to let everyone how happy and thrilled I am about it. To me it was a great success and if I can recommend it to anyone I know that has prostate problems now or in the future, Dr. Patel is who they should come see. I guess it was 3 months ago, I went in for a test. It's a funny thing how I found this out. People will not believe this: every time I looked at my cell phone for a 2 week period I had a missed call from a doctor that took care of me, my neurologist. After the 3rd time, I called him back and said, what do you need — and he said, I never called you. I took this as a sign to get my prostate checked. So I went to get it checked, And my PSA number went up from 3.9 to 5.3. I didn't think it was such a big jump, because I felt no problems what so ever. And after going through a biopsy, we found I did have cancer. When you get diagnosed with Cancer you think, well is this the end? But the doctor assured me I could still live several more years, but there was no guarantee. I did some research and talked to doctors that I had some confidence in. My own urologist, the head of radiation in Cincinnati, the top guy who dealt with seeds in the prostate. And I talked to several people on the telephone, some of them had had the robotics surgery and some the traditional way. I just wanted to know who was the best to have this done. I know that when you say who is the best, to me, I think the more you do – like shooting baskets, the more you shoot the better you get. If I shoot a ball for 10 or 12 years, I'm going to be an expert at it.. And Dr. Patel has done so many of these, there was no doubt he was an expert in my mind. I knew once I spoke with Dr. Patel, there was no doubt about it, I was going to have this done. Because I knew, he was the surgeon I needed. We went over the procedure, about everything that was going to happen, before and afterwards, how long I was going to be in the hospital, what I was going to need to do when I got out. They have a great staff and a great team effort, and Dr. Patel should be proud of his staff. There are a lot of things in life, that won't be that easy to take care of. I'm very happy about this, it takes a load of my mind and also my family's mind as well. In life, there are so many things that happen, sometimes you can take care of these things, and sometimes you can't. this was something I was able to take care of and I'm happy about it. The procedure was easy to go through, and I'm happy about the way it's turned out.